Lot Size: 2696 Square Ft. 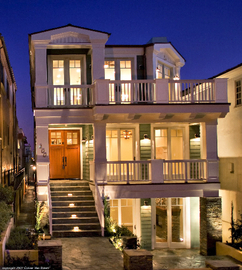 This classic Cape Cod-Style home offers Beach City Living at its finest. Located on a highly desirable Manhattan Beach walk-street, this 4,202 sq. ft. 5 bedroom & 4.5 bath residence boasts exceptional panoramic ocean views from the Pier to Catalina, Malibu & Santa Monica. The exceptional tri-level floor-plan consists of a well-appointed Gourmet Kitchen with Viking, Sub-Zero and GE profile stainless steel appliances, a spacious Family Room with access to a walk-street stone patio, Formal LR and Family Room with fireplace, built-in wet-bar with wine fridge, Master Suite with sliding French doors leading a balcony offering views, and so much more.